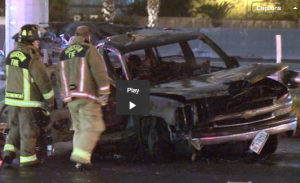 Early this morning a Chevrolet Suburban left the roadway on the Southwest Freeway feeder road, hitting a metal light pole and bursting into flames. Three occupants of the vehicle died in the crash. Police say the vehicle flipped over before hitting the pole near Sands Point Drive around 1:45 a.m. It appears that excessive speed was a factor in causing the crash. This entry was posted on Saturday, January 3rd, 2015 at 1:46 pm and is filed under Auto Accident.